We have gained recognition as a flourishing organization for providing a wide range of Cable Trays Cover. These are sturdy in design and are appreciated for their easy installation, non-corrosive nature, and abrasion resistance. We supply a good quality of Cable Tray Covers that are manufactured in compliance with international quality standards. These are manufactured by high grade raw material like mild steel, stainless steel & aluminium. Our cable tray covers are known for their strength and high capacity and at the same time are well suited for heavy duty power distribution in industrial facilities. We offer a complete range of Cable Tray Covers and Cable Tray Systems, which is fabricated by using superior quality raw material. Designed by our expert engineers, cable trays are highly useful in supporting power distribution cables, sensitive control wiring, high voltage power lines and varied telecommunications wires. Cable trays are the structural component of a building electrical system. We offer cable tray covers that are in compliance with international quality standards. We use quality raw material such as mild steel, stainless steel & aluminum for manufacturing our range. Our range offer strength and high capacity which very well suit to heavy duty power distribution in industrial facilities. 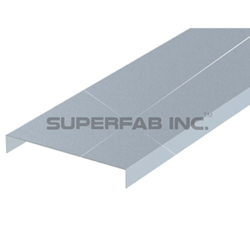 Cable Trays cover protects from falling object or debris as many occur beneath personal walkways. Cable tray covers shielding from ultra violet race of the sun and Guard against other weathering elements. Solid Bottom Cable Tray Covers are available for straight sections and fittings to provide cable protection in any application. Multiple styles of cover clamps are also available to maximize flexibility. Style: Flat or Plane & Tempered. 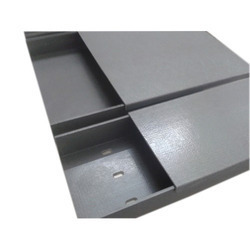 Being a leading industrial firm we are offering Steel Cable Tray Cover to our customers. We are presenting an excellent quality assortment of Cable Tray Cover. We are manufacturer and supplier of Cable tray cover.